Rocket are delighted to share the official photographs of the star-studded Summer Exhibition Preview Party at The Royal Academy where they provided catering. In the words of Grayson Perry, the key theme for the exhibition was “Art made now” in celebrating “diversity, democracy, humour” and the “colours of the summer” which for Grayson are turquoise, sky blue and day-glo yellow. 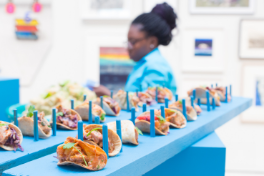 Rocket’s inspiration behind the food was very much in line with the exhibition - three distinct blocks of colour that are represented through food, drinks and styling. 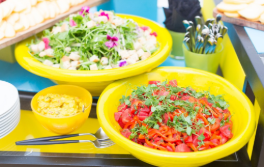 Turquoise was alive with vegetation and activity as their chefs snipped herbs, wrapped, rolled and served guests a variety of Vietnamese summer rolls and zingy Mexican tacos. Day-glo yellow was a fusion of flavours, cooking techniques and ingredients from the world including charcuterie boards, smoked roast chicken, and spiced watermelon. 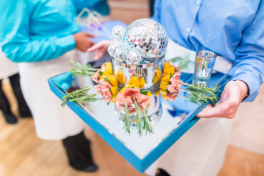 Sky-blue was a feast of seafood, from crustacea perfectly prepared with accompaniments to a glistening oyster bed with edible flowers and quirky garnishes. 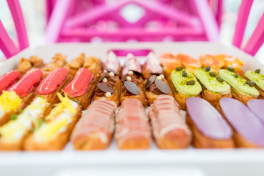 The big reveal of the evening was decadent, delicious and fun: a 10 foot Ferris wheel holding trays of colourful "Claire's Eclairs" paying tribute to artist Grayson Perry's alter-ego. Guests were then treated to a private performance in the courtyard by award winning singer/song-writer Anne-Marie.